Most people get into multiple car accidents over the course of their lifetimes. The first question that those people typically want to know immediately after their accident is: who was at fault? Fault can be extremely important. In Utah, there is a no-fault law that dictates that each party’s insurance provider will pay the medical care costs for their own insured up to $3,000. However, even that $3,000 gets paid back behind the scenes on the back end by the at-fault party’s insurance company. So, in the end, the insurance company of the at-fault party will end up paying for all the damage associated with the accident. That is why determining fault is a huge deal to the insurance company. If they can dodge fault, they can save an enormous amount of money. Fault is determined based on negligence law. Whichever party was deemed to be negligent in the eyes of the law will be found at fault. Utah is a comparative negligence state. That means that no one party has to be labeled as 100% at fault. Sometimes it might be a mix. Most accidents do result in one party being 100% at fault. A classic example of this is if someone is rear-ended. Drivers are expected to be ready for cars to have to stop in front of them, so they bear the burden of stopping in time. Insurance companies love to find a way to find the other party at least partially at fault, if they can show that the victim was actually 33% at fault, then they only have to pay the victim 67% of the total damages resulting from the crash. In order to avoid this, there are some things that you should do after any accident to ensure that the process runs more smoothly. One is that you should always get a police report. Although they are not 100% necessary, and fault can be determined without one, the easiest way to make a slam dunk case for fault is to cite to a police report where the officer, as a neutral third party, clearly states that one party is at fault. Many times citations are given to the at-fault party; that can be helpful as well. Remember that these reports are not absolute. Police officers exist to enforce the law, not to interpret it, they may be wrong about handing out a citation or not, but it is helpful when they do. A second helpful thing to do immediately following your accident is to take pictures with your camera phone. Take pictures of the damage to both cars. Take pictures of the scene. Take pictures of the other driver’s license plate. Take pictures of the other driver’s insurance card. Those pictures will be helpful in many regards, the first of which being that they will help in determining fault. Another important tip to remember is that you should not admit fault at the scene even if you think you may be at fault. The problem is you do not know for sure that you were at fault. 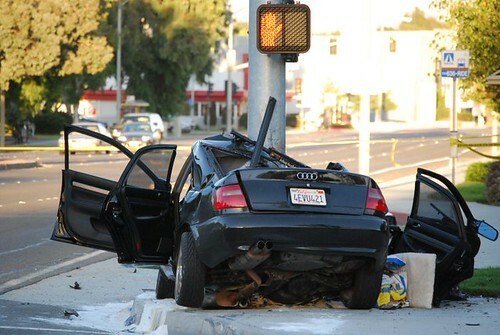 Allow an auto-accident attorney to advise you of his professional opinion before hurting your own case. Your insurance premiums will not automatically increase if you are determined to be at fault, it with be considered with many other factors including your overall driving record. Insurance companies know that their insured will eventually cause an accident. It’s not the end of the world. If you have additional questions about what you should do to help determine fault contact a St. George injury attorney.